The odds were always stacked against me ever knowing anything about my culture. Growing up, I was never sure what it meant to be a Hindu. I grew up in a quiet town where my family ran (surprise, surprise) a newsagent shop. There weren’t any other Hindus my age in the area. In fact I never really got a chance to mix with any non-white people until I went to a university in London at the age of 18. Neither was I lucky enough to have any Hindu philosophy taught to me. My parents themselves knew so little beyond the superficialities. But, like virtually every Hindu household in the world we had a few pictures of the Hindu Gods and Goddesses on the walls. It was through one image in particular that I somehow maintained a connection with my faith and heritage throughout my life. That was Mother Durga. Ever since I was a tiny kid, I used to gaze at Her and felt a deep sense of reverence. As I found out later, Durga is one of the world’s most powerful symbols of raw divine female energy, called shakti in Hinduism. The worship of female divinity is something unique that Hindus have been able to preserve. There was once a time when female divinity was worshiped throughout the entire world. But in most cultures, that was slowly superseded by very male-centric, less spiritual religions and beliefs. 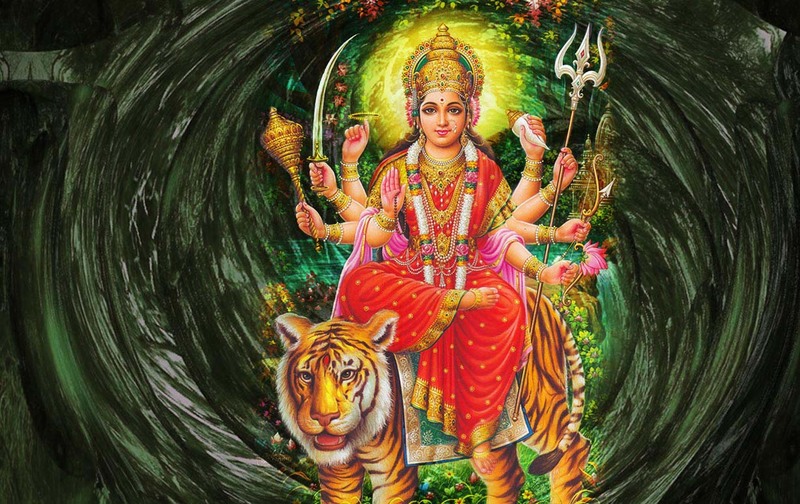 The fact that Hindu culture, at very primal levels (though not always through its treatment of real-life women) has preserved and continued to worship the female aspect of divinity is something truly beautiful. I was nine years old when I first went to a Navratri celebration, the festival dedicated to Goddess worship, and had no idea what to expect. The atmosphere overwhelmed me. I had never seen anything like it. The number of people, the energy, the devotion and the festive mood all combined to make a memorable and magical experience. Not knowing what to expect, I was taken completely by surprise when I was thrust into a central area where a few people were dancing. I remember feeling very self-conscious and just wanting to get back out. But what struck me the most was the rotating shrine in the middle of the hall. It had the familiar picture of Durga, but much more splendid than the one at home. It also had images of other Goddesses, who I had never seen before. People came to the shrine and bowed down, so I asked my dad if we could do the same. When I went to the shrine I concentrated on the image in front of me intensely. In that moment I forgot the big celebration, the hall, and everybody else around me. It was just the Divine Mother and me. Up until I went to university, there was little else Hindu in my life. Throughout my teens I was the proverbial ‘whitewashed Indian’. But my belief in Mother Durga, which wasn’t really a belief in the typical sense of the word but rather a sense of awe and mystery, remained with me. And that imparted to me a sense of awe and mystery to the whole of Hinduism, which I actually knew precious little about. When time came for me to start university I desperately wanted to be around other people who had experienced this feeling, and could help me expand my knowledge. This is what led me to join the Hindu society at my university, and take an active part in it, which gave me a chance to be around some people who knew a lot more about Hinduism. I started to do some reading on Hinduism and for the first time, my inner desire to explore Hinduism at a deeper level began to be fulfilled. And it was all thanks to Mother Durga! What a wonderful, inspiring story. Good luck! Very inspiring and best wishes! I have recently moved to India and visit a Durga temple everyday! I loved reading this, a lot of my friends back in UK are British born Indians so I know how you must feel sometimes.